Monday October 3rd 1892 We got the washing done by eleven oclock and the dinner ready on time. I was doing a little sewing in the afternoon. I helped with the supper work. The Woolf family all came over to spend the evening. Tuesday October 4th 1892 We got the ironing done early this forenoon. Father and Mother took dinner in town. Will and I went over in the buggy in the afternoon. Will has a very bad cold. I brought Mother home with me. I wrote letters in the evening. weather very dry and the dust is bad. Wednesday October 5th 1892 I was busy about the house work all forenoon and after dinner did sewing. Will is much better and put in some work on the road. Mother and I walked down to see them work the grader just before supper time. Will and I spent the evening in town. Thursday October 6th 1892 I got time this forenoon to put in a comfort to quilt besides getting the dinner. Mother and I began quilting soon after dinner. The girls came over to help. I had two more boarders come before supper to take the north west room up stairs. We quilted in the evening. Friday October 7th 1892 I was busy with the work most of the forenoon. Mother worked on the quilt. We finished it about the middle of the afternoon. I then dressed and Will took me over town I was invited to Lathrops to tea with the girls. We had a pleasant time. Will came for me in the evening. 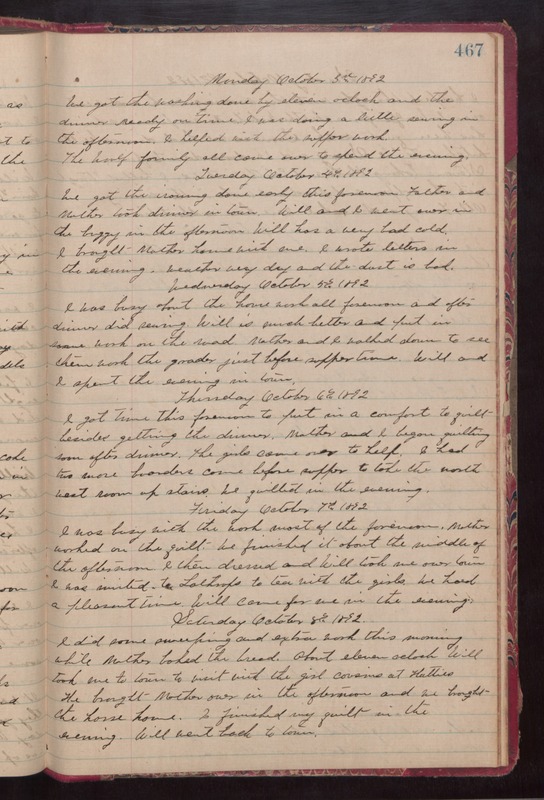 Saturday October 8th 1892 I did some sweeping and extra work this morning while Mother baked the bread. About eleven oclock Will took me to town to visit with the girl cousins at Hatties. He brought Mother over in the afternoon and we brought the horse home. I finished my quilt in the evening. Will went back to town.